The Grand Hyatt Dubai is rated among one of the finest, largest and most sophisticated hotels in Dubai and whole UAE. Conveniently located on the south edge of the Dubai's historic creek in the heart of Bur Dubai- the financial and trade district of Dubai, the Hotel Grand Hyatt Dubai is only ten-minutes away from Dubai International Airport and close to the Dubai Creek Golf and Yacht Club. Set amidst the 37 acres of landscaped gardens with enchanting waterfalls and sweeping lagoons, the hotel offers world-class amenities, unrivalled in Dubai.The Grand Hyatt Dubai offers first-class facilities to its valued guests. The Grand Hyatt Hotel Dubai has a total of 674 well-appointed rooms that include 198 Grand rooms, 283 Creek Side rooms, 133 Grand Club rooms, 18 Grand Deluxe King rooms, 23 Grand Suite King rooms, 10 Emiri Suites, 7 Prince Suites and 2 Royal Suites, all equipped with modern facilities such as centralized and remote controlled air-conditioning, Balcony, spacious private bathroom, Bathrobes/slippers, Minibar, Cable/satellite TV, Direct-dial phone, Bathroom telephone, High Speed Internet access, Hair dryer, Tea/coffee maker, Housekeeping, Wake-up calls, Complimentary toiletries, Electronic/magnetic keys, Alarm clock with radio, Smoking rooms, Cribs (infant beds), Complimentary newspaper and a host of other facilities. The Hotel Grand Hyatt Dubai also offers villas, residences and suites with extra amenities. 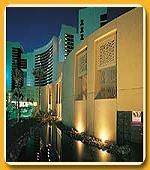 The Hotel Grand Hyatt Dubai houses 14 restaurants, bars and cafes offering a variety of world's finest cuisine. With a choice of authentic, international dining including Italian, Vietnamese, Singaporean, Lebanese and a fine American grill restaurant, as well as wine and cocktail bars, Grand Hyatt Dubai offers an unique dining experiences to its valued guests. While 'Awtar' offers the finest in Lebanese cuisine, Manhattan Grill serves grill cuisine consisting of cuts of grilled meat, poultry and seafood. Andiamo is an Italian cuisine of great flavors and Indochine serves delicious cuisine from Vietnam, Laos, and Cambodia. The Market Caf� is a hot favorite with guests serving from Italian pastas and salads, authentic Arabic cuisine, grill and rotisserie, aromatic Indian favorites, or delectable deserts. Pepper crab serves delicious fish and seafood with Singapore flavors. Panini Italian cafe and deli offers a selection of specialty coffees, Panini sandwiches, and pastries. The watering holes at hotel include Vinoteca- an Italian wine bar and Cooz - an stylish jazz bar serving a fine selection of premium champagnes, malt whiskeys, cognacs, and smooth cocktails from around the world. The Grand Hyatt Hotel Dubai is well equipped with ultra-modern digital technology and communications to meet the ever-changing needs of the guest. The hotel has a sophisticated Business Centre offering the best of conference facilities within a resort environment. The facilities include Private offices, Boardroom, Printers, Scanners, Broadband Internet access, E-mail / Internet services, Secretarial services, Courier service and Mobile phone rental and a host of other facilities. Furthermore, Grand Hyatt Dubai also offers an enchanting, purpose-built outdoor space amid the hotel's gardens providing endless possibilities for inspirational events, conferences and incentives. The Grand Hyatt Dubai offers first-class fitness and recreational facilities to its valued guests. The hotel has a modern fully equipped gymnasium, a Grand Spa & fitness centre, Tennis and squash courts, indoor and 2 outdoor swimming pools and jogging track set. Besides, guests can also enjoy at Mix- a multi-leveled nightlife complex- at the hotel offering ultimate entertainment to its visitors. He guests can also enjoy golf at a nearby golf course. Other services available to guests include 24-hour room service, Non-smoking rooms Safe-deposit facilities, Technology concierge service, communications centre, airport limousine, Tour and travel desk, 24-hour laundry, doctor on-call, beauty salon, sightseeing tours, parking facilities, Shopping arcade, Multilingual hotel staff, Valet car parking, Parking facilities for 759 cars and Major credit cards accepted.